← Design Culture Salon 5 — How Does Design Produce New Publics? 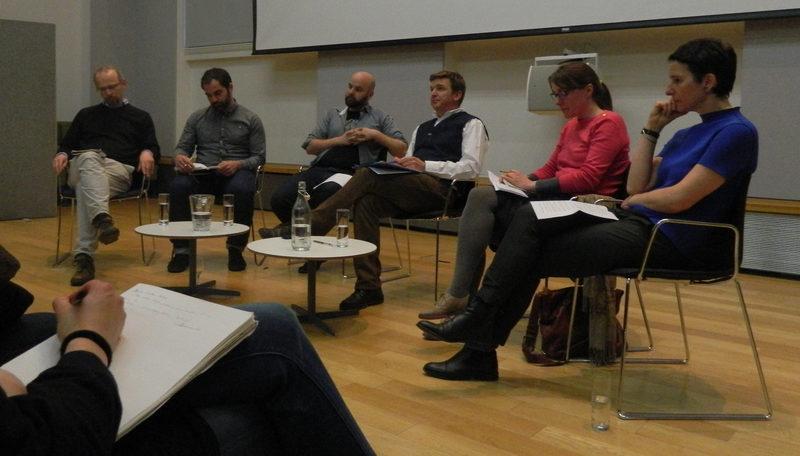 Reflections on Design Culture Salon 5: How does design produce new publics? The idea of what, or who, constitutes a public takes fundamentally different forms under different authors. Proclamations of the public in singular, ‘One Nation’ and ‘Big Society’, form rallying calls for the current political parties. As Guy Julier, who chaired the evening pointed out, Margaret Thatcher famously stated, ‘there is no such thing as society, only individual men and women and their families’, while Tony Blair obsessively leant on ‘the people’ , as an ideological tool in his everyday vocabulary. The early design reform movement in Britain was motivated by the aim to educate the public on matters of taste, whether through the Council of Industrial Design (1945), (now Design Council), the V&A or even the Design Museum (1989). But the design landscape has widened beyond recognition since then, with an understanding of design that is both material and immaterial. So where does the public fit into this bigger picture? Breaking the question down into its constituent elements, Julier posed the questions: Does design make a specific claim to new publics? Produce or reinforce? How new? Are there better terms than publics that we can use? Adam Drazin was the first to offer his view in a position statement that opened up many of the central themes for the evening’s discussion. As an anthropologist, he affirmed the validity of the question by stating that design works differently in different places. Centrally however, he argued that architects and designers sometimes set up expectations and environments to create publics, but that this is sometimes artificial, resembling a one-way dialogue. The hierarchy of ownership implicit in any design project calls into questions issues of legitimacy and entitlement, stating that designers must always question ‘why should people come to your tent in the public space?’ Speaking from experience of his time in Romania, where public squares and spaces were void, he stated that the concept of publics should not be taken for granted. Publics do not necessarily exist, he argued, rather they are a process and this longer-term view is essential to design. Adam Thorpe threw out the question of who cares? Referencing John Dewey’s publication The Public and Its Problems, (1927), he stated that publics ‘snap into being around issues of concern’. The designer’s role is to act on this by articulating and sharing concerns, through ‘social conversations’. Design can produce physical objects that respond to environmental concerns , such as through his fashion company Vexed generation that produced face-mask design parkas in response to the increased pollution and the use of cctv cameras in Britain in the early 1990s. This, Thorpe suggested, is how designers can start conversations. This materiality does not have to be physical however. Other examples in his experience include exhibitions and film screenings by the Design Against Crime group at Central Saint Martins which drew attention to the public issue of cycle theft in an engaging and communicative way. Joe Harrington added another dimension as an advocate for the co-design method. More specifically, his experience in the Lambeth Collaborative aims to apply the principle of co-production to radically change mental health services. The collaborative is made up of leaders, carers, GPs and psychiatrists. They define co-production through the following key principles: blurred distinction between public and professional; reciprocity; mutuality; building on people’s assets and networks they already have and facilitating change. Harrington was overtly critical of the heroic designer-centric culture that has traditionally been embedded in design practice. One of the main challenges, he argued, was for designers to write themselves out of the process and focus on the concept of design as a transformation. He argued that ideas require lots of people and needs to be seen as a constant process and core tenet in addressing social change, not a one-off event. Noortje Marres brought to life a powerful example of how design’s ‘publics’ might be viewed from the outside, through twitter. By doing a quick search on design words that had been hash tagged, such as design thinking, service design and finding their associative terms, she found that 9,2550 distinct users have used design related words in the last week. The main words associated were innovation, start-up, co-design, and problem solving. But is it correct to think of this as evidence of a design ‘public’? Probably not, Marres argued, primarily because these references were not connected to any broader issues such as the environment or health. In many ways this example got to the heart of the question in suggesting that publics can not be made. ‘An actual public is something that happens and definitely not something that can be created on demand’, she stated. For it to be a ‘real public’, the discussion has to include something other than design as well. Jana Scholze returned to the phraseology of the question, which she suggested seemed to frame designer and the public as opposing entities. Both these terms and their relationship to one another, she stated, have become increasingly blurred. As an example of this, she cited the London based designers Superflux who recently designed a project to create autonomous drones which form their own temporary wifi to fly around the city. In this example, the identities of public and designer, user and creator, are intentionally masked and blurred, making it impossible to ask practical questions about who is paying for the work, or who the work has been created for. This absolution of responsibility and ownership reminds us of what is at stake in the question of how design creates publics. Equally, this makes the question more urgent. Guy Julier interjected at this point to highlight some recurring themes that included ownership and temporality. He asked the speakers to share their thoughts on whether they felt that this was an historical moment. Could the same conversation have been had ten years ago? While Adam Thorpe stated that designers had been called into action around the time of the economic crisis, Noortje Marres felt that the ‘historical moment’ had been longer and more drawn out than this, with a broader participatory movement in politics. Jana Scholze stated that 3D printing and other recent innovations had made the relationship between the designer and the public more complicated. Therefore the fundamental question might not be new, but its current inflection was. Adam Drazin picked up on some of Marres’ earlier points, stating that ‘imagined communities’ often obscure the view. This is the case in Ireland, he argued, where there is an ‘over-determined sense of community’ but a poor public transportation system. This paradox suggests that ‘fictive publics’ can be culturally or notionally created. A member of the audience asked the panel to consider the role of counter-publics, seeking a more nuanced response to the opening question. Joe Harrington argued that one of the key roles of the co-designer was to enable dissidents, affording them activism. Adam Thorpe pointed out that there had been a lot of fictitious co-design in the past that had only superficially engaged with publics. On the other hand, he presented the commonsensical view that designers might be misguided in the assumption that they need to seek out new publics, and should remember that they are only making a contribution alongside other members of the public. This was the first time in the debate that a member of the panel had overtly described the designer as a member of the public, though it was re-stated by Thorpe when a member of the audience asked if‘designers are ‘flâneurs or a man of the crowd’. Towards the end of the discussion, Marres said that she had been surprised that the designer and not the designed object, had dominated the evening’s discussion. This was an interesting point, given that some of the speakers stated that designers needed to ‘design themselves out’. The strongest theme to emerge from the discussion was that of ownership: if design does have the ability to call publics into action, do designers then own these publics? The panel agreed that they should not, but the question of how this would work in practical terms, given the entrenched economic hierarchies of the design practice, was not clear. One promising idea came from the early evocation of publics as a process, meaning that designers should let go, move slowly and, as Thorpe stated, fight the urge to ‘run ahead and create fake publics’. This post has been guest written by Leah Armstrong, PhD Candidate at the University of Brighton and Research Officer in Contemporary Design Culture at the V&A Museum. This entry was posted in publics. Bookmark the permalink. 4 Responses to Reflections on Design Culture Salon 5: How does design produce new publics? A question from Julia Lohmann (in the audience), hinted at the “elephant in the room”. She asked; “What skills should we teach the designers of tomorrow; what can we bring to design to deal with future problems?” I’d suggest that future problems are current problems and that the designers being educated today, like those educated over the past 40 years, are most likely going to keep adding to our problems. It’s a matter of expectations. Young designers at university may participate in a couple of “social good” projects, but on the whole their expectations revolve around getting a good job in industry, making money by making stuff, and paying off their student debt. And the education system is still feeding that expectation. Was the debate suggesting that the notion of designing for the “individual” has been superceeded? Looking at the history of design, that’s more or less been the industry’s raison d’être. If we’re honest about it, we’re a long way from that situation changing, and it’s not necessarily designers who are in the position to drive that change; they can communicate the need for change though. Not only is there a lag in the teaching of design that investigates the notion of “social good”, but when it does occur in universities is it more than mere window-dressing? Until the expectations of design graduates are fundamentally examined and changed, then it isn’t. Part two of this process necessitates educating the public (including future designers who are still at school, and their parents), as to what design is and it can be, promoting the notion that it is a tool for change and not an end in itself (in the form of a product); that’s when those career expectations will change. Museums, which are a powerful intermediary between education, the public, government and commerce, could enter into this conversation by staging exhibitions and displays that tackle issues rather than merely fetishizing objects.